There’s one house on the way to the farm, that I always slow to a crawl when I past. The Raniers. In the mornings, their motley crew of dogs, comprised of two labs, one black and one yellow; a stout little beagle, and a bug eyed chihuahua bask in the warm sun in the middle of the one lane country road, or explore the ditches and field adjoining the road’s worn pavement. They’ve become kind of like friends, as I pass them each morning and think “good dogs” to myself and while struggling to get that last drop of coffee out of my travel mug. The afternoons are a bit of a different story. Replacing my familiar furry friends is a flock of nervous barnyard fowl, ranging from roosters to chickens in various and sundry breeds, and a wild turkey. Yes, I said wild. Apparently, Jamie and Lori, the owners of this tiny ranch, raised this turkey from an egg their son Hunter found. The turkey has grown to assimilate to its much smaller family of chickens without even noticing that its giant stature makes it so different. 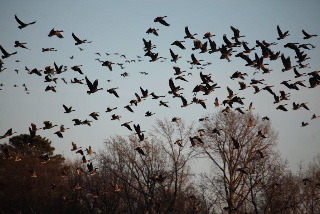 On my way home, like any other day, I slowed as I approached the birds while they meandered across the road, scratching and pecking in the dirt that surrounds the blacktop. The only thing different about this encounter was that the turkey stood firmly in the middle of the road, refusing to budge. As I nudged my car closer, it began walking toward me, never breaking its defiant gaze. I finally put the car in park when I realized that I wasn’t going to win this game of “chicken” (pun intended), and stared back. It looked at me as if to say “this is my turf” without caring in the least that I was in a Jeep, and that it was outweighed and out horse powered. I jumped out and shooed it out of the road, and to my surprise as it slightly side stepped my path, it pecked at me! 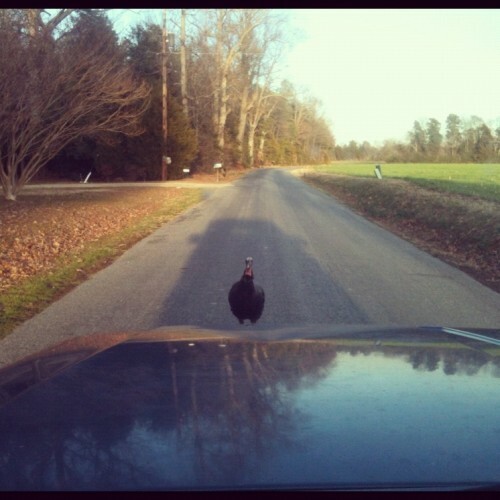 I jumped into my car and looked in the rear view as I began to pull away: the turkey was there. As if from some nightmarish Hitchcock movie, I was now being stalked mercilessly…by an evil turkey. I sped up, and he sped up. It wasn’t until I’d hit almost 25 MPH that he gave up his chase for an easier pursuit. I got a good laugh from my friends when I told them about my day and my face off with the ornery bird, and still cautiously drive past the Ranier’s in the afternoon, always looking back for fear of that crazy turkey! This time of year always feels magical to me- as if anything is possible. You can just feel it in the air- all of the goodwill, warm spirits and excitement- it feels like being a kid again, when everything felt full of wonder. I felt that same wonder when I walked into our chicken coop to gather eggs, and I found seven fuzzy little presents tucked below our two Columbian Rock hens. Though well out of season for hatching chicks, these two white and black hens have been anxiously sharing a nest, a process we call “dumping”. The two laid in the same nest, taking turns keeping the eggs warm. In warmer months when laying is more common, this can actually kill the chicks, as they get too warm with the dual body heat, but since we’ve been getting so cold at night here in zone 7, it was necessary for the chicks’ survival. We leave the lights on in the coop at night to reschedule the hens’ natural cycle, encouraging them to lay eggs throughout the winter. When daylight hours begin to shorten, leaving the lights on for longer periods of time will stimulate the hens’ pituitary glands and trick them into continuously laying eggs. This doesn’t harm the chickens, and we get to enjoy fresh eggs all year round! 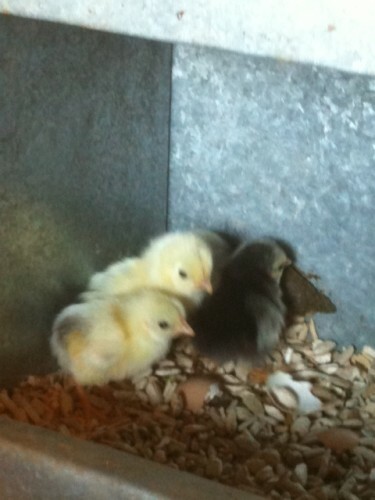 Though this was a man-made miracle, we were still in awe that these little guys had hatched. I guess it was only a matter of time before our plucky little rooster was able to woo these two ladies, resulting in our newest little additions. I guess you just can’t stop nature’s agenda! We love the Columbian Rocks because of their beautiful markings and small stature. 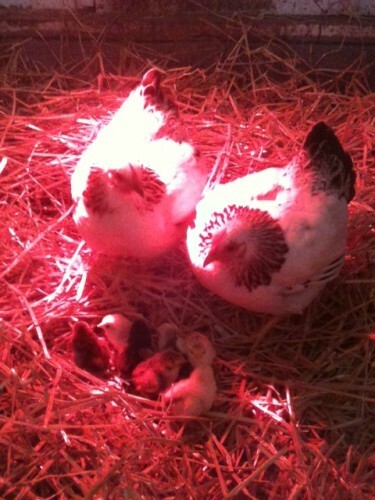 Though we know we should have kept a closer eye on our randy rooster, the chicks will have a warm home in our brood house, which is filled with straw and heat lamps to keep them nice and cozy. 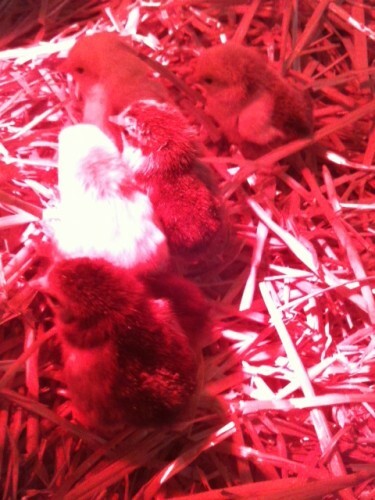 Both mothers and the seven chicks are all doing great and enjoying all of the warmth and attention. We hope that this season holds all of the awe and wonder for you and yours, that we felt upon finding these little guys this morning. I think that’s one of the best parts of this time of year, the childlike wonder that we all recall that allows us to pause and appreciate family and friends. From all of us to all of you, we hope you have a wonderfully warm holiday season, and keep your eyes open for everyday wonder! For many of us on the East Coast (particularly MD, DC and VA), this time of year not only marks the first warm weeks which hint of the coming spring season; it means to prepare for the invasion. 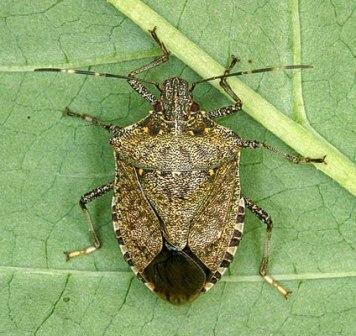 It’s not a terrorist or nuclear threat we’re talking about…it’s something far smellier: stinkbugs. 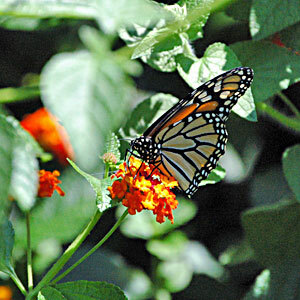 In 2010 our region suffered a swarm of these foul little pests and as we begin seeing warmer weather in this (hopefully) early spring, they are beginning to settle in like unwanted house guests. Though they don’t bite or sting, they do emit a pretty putrid odor when crushed, smooshed, vacuumed up, or squished, and though they are more of an annoyance for homeowners, local farmers are beginning to fret. 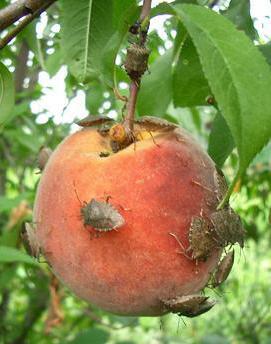 Stinkbugs prey on crops like raspberries, tomatoes, peaches and other fruits, sucking the juices out of them and leaving them undesirable. Especially in the organic farming community, who strive not to use harmful pesticides, concern is on the rise. 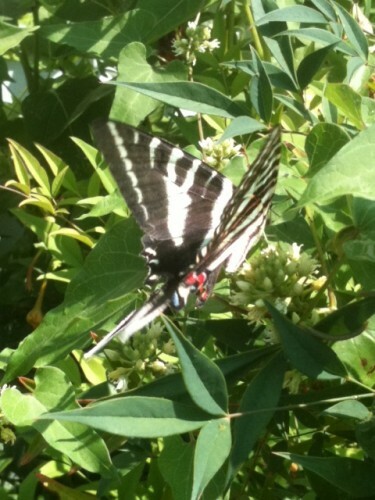 So, what is your best line of garden defense against these pungent perpetrators? The all natural answer is herbs! 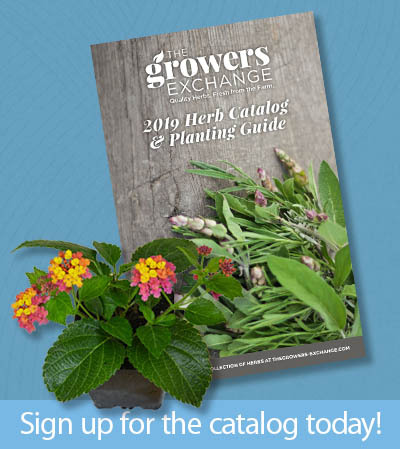 Strongly scented herbs such as Mint, Lavender, Catnip, and Patchouli have been proven to thwart the little stinkers from overwhelming you favorite fruits and veggies. (It’s hard to believe that they are picky about smells…I guess everyone likes their own brand!) 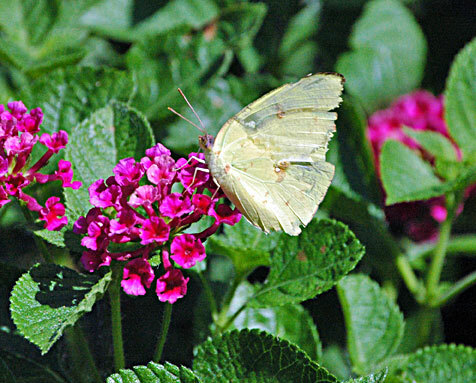 You can also try planting other natural insect deterrents around your home or garden like Tansy, ‘Citronella’ Scented Geraniums, Pyrethrums and Rue to keep the bugs at bay. For the insidious insects that have already made it indoors, try making sachets with some of these herbs or use their essential oils to coat your window sills and thresholds. 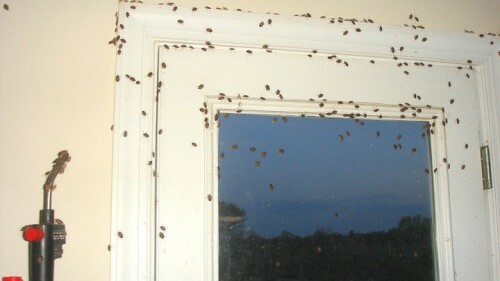 This will hopefully keep the rest of the stinkbugs from sneaking in and joining their friends inside your nice warm home. You can also fill jars with soapy water to catch the critters that have already begun to show up indoors, as the soap will dissolve their exoskeleton, killing them in a non-toxic way. 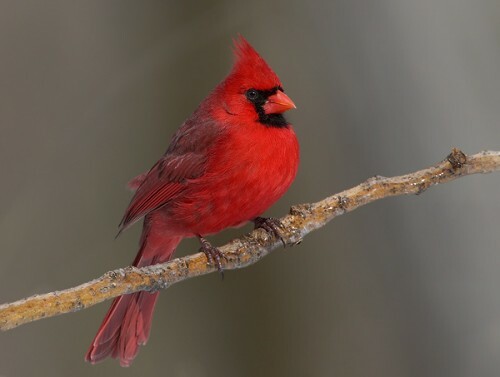 In conjunction with February being National Bird Feeding Month, try attracting birds to your garden with feeders, houses and baths, to keep your bug problem to a minimum. We’ve heard that blue jays are fond of these stinky little snacks, so encourage them and other seed-eating friends to nest around your yard to prevent the problem from getting out of hand. Bats also find stink bugs to be a delicacy, so place bat boxes throughout your yard and near the garden to help battle the bugs. Working in the greenhouse today, we were lured from our mundane task by the uproar of several hundred, maybe a thousand Canadian Geese in the adjacent field. After a few moments of loud and excited goose talk, we all ran outside to see them fly over. Whatever it was that scared them was not so bad because most settled back where they began. Some landed in the field beyond our orchard, giving us a clear view of flock after flock gliding in on set wings. We went back to work when most of the birds had settled back in the fields, foraging ravenously before the next cold weather arrives. And we went back to inventory. But even counting everything is not so bad when you can take a break with the neighbors every now and then.